SAN DIEGO, Dec. 29, 2016 /PRNewswire-USNewswire/ -- With Thanksgiving in the past and more holidays ahead, Wounded Warrior Project® (WWP) recently provided injured veterans and guests a break from the hustle and bustle of the season. 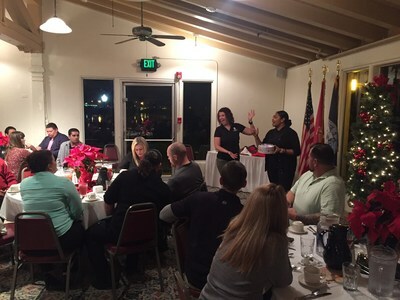 The group attended a holiday dinner at the Marine Corps Recruit Depot's Bay View Restaurant. As they dined and socialized, injured veterans experienced firsthand what is possible at social events that connect them with fellow service members. "I have a hard time getting out of the house, and activities like this help me," said Coast Guard veteran Kristopher Moorehead. "I know I'm going to be around other people who are like me, so we're already on the same page. Plus, we often get to do things that we wouldn't normally do, which has been very good for my family." To start off the evening, guests were organized into teams for a variety of challenges. Each group had to work together on word and memory games to win holiday-themed prizes, including home decorations and cookie-making kits. Once dinner was ready, the group sat down to stuffed chicken, prime rib, vegetables, and pumpkin pie. By the end of the evening, veterans were exchanging phone numbers with new friends they had made. "I thought this outing would be a nice way to connect with other veterans and families," said Marine Corps veteran Katie Krefft. "We had a delicious meal and played some fun games. It was really cool." These outreach activities support the long-term recovery needs of warriors by reintroducing them and their families to the unique bonds experienced during military service. By creating the opportunity to form these friendships – in settings that accommodate physical injuries and social anxieties – the potential for isolation is lessened. In a WWP survey of the injured warriors it serves, more than half of survey respondents (51.7 percent) talked with fellow Operation Enduring Freedom, Operation Iraqi Freedom, or Operation New Dawn veterans to address their mental health issues. "My family and I have benefited from doing things outside of our comfort zones and normal routines," Katie said. "It means increased confidence and better social and coping skills. We've learned a lot, and we have been able to share that information with the friends we have made." WWP staff members interacted with attendees throughout the evening, advising them of additional services to assist in their recovery processes. They learned about how the Combat Stress Recovery Program addresses cognitive and mental health issues following deployment, and how the Warriors to Work® program bridges the gap between injured veterans and civilian employers. Through the generosity of donors, these resources, programs, and outreach activities are available to warriors and family members at no cost to them.